President Trump asked the Internal Revenue Service (IRS) for an extension on his 2017 tax return, the White House announced on Tuesday. "The President filed an extension for his 2017 tax return, as do many Americans with complex returns," White House press secretary Sarah Huckabee Sanders said on Tuesday. "He will file his tax return by the extension deadline of October 15, 2018." Trump broke a long-standing precedent during the 2016 presidential election by refusing to release his tax returns. 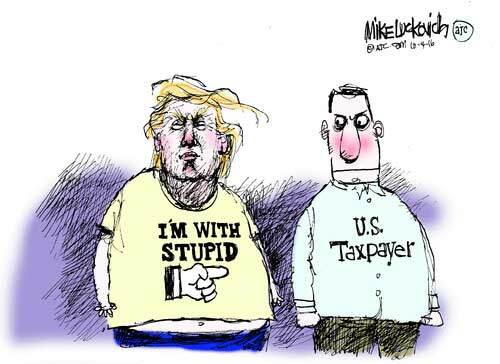 He refused to release his tax returns after his inauguration as well. Trump has claimed he cannot release his tax returns because he is under audit, but the IRS has said an audit does not prevent a person from releasing personal tax information. The announcement from the White House comes on Americans' final day to file their taxes with the IRS. Earlier on Tuesday, the IRS said that its electronic system, which many Americans use to file their taxes, had experienced partial failures. The issue might affect millions of Americans who are planning to file their taxes before the midnight deadline. IRS Acting Commissioner David Kautter told the House Oversight and Government Reform Committee on Tuesday that Americans can, like the president, request a six-month extension on their taxes on the IRS website.